Photo of the steps of the United States Supreme Court building on the morning of June 26, 2013, hours before the court overturned the Defense of Marriage Act. You meet interesting people on trains and so I did on a recent trip from Germany to Poland: two bright, articulate, young Polish women who, as it turns out, are a couple. We got to chatting during a long train ride and the topic somehow moved onto the subject of the U.S. Supreme Court’s recent decisions in June that strengthened gay rights. The women talked about how heartened and moved they were by the advances in gay rights in the U.S. – and then gradually mentioned that they were a couple and had few such rights in Poland, in part due to the pervasive conservative influence of the Catholic church. One woman, college-age, said she could not tell her parents she is gay because they are very conservative (anti-gay, anti-Semitic et.al.) and definitely would not approve. The other woman, slightly older, said she’d told her parents and was surprised and pleased that they accepted the news reasonably well. I felt for them – and it reminded me that the fight for gay rights in the U.S. is being closely watched by gays/lesbians elsewhere who, alas, have an even tougher fight. Interestingly, this conversation took place after a young guy who was also in our train cabin left for a bit. When he returned, the women and I exchanged a quick knowing look and changed the subject. Bar Smak, for Bigos, pickled cabbage with bits of meat, sausage, onion,garlic,mushroom, and pierogi filled with spinach. – Yellow Dog, hip minimalist Asian restaurant looked good but decided to stick with bar Smak, small untrendy,popular with locals. When else will we have authentic Polish food? Smoked Cheese, salami, garlic sauce, mushrooms, pickles, whatever. We saw people eating this late at night, presumably taking a break from a beer garden. – beer garden across the street from our Kupa Street hotel, Karmel,, on Jozefa Street. -warsztat, recommended little restaurant among the busy ones on the one block but hopping Izaake Street, just north of our hotel. 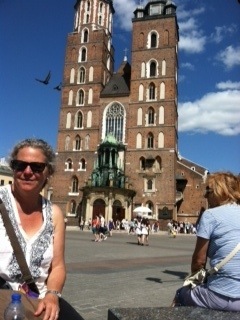 We spent much of our last day in krakow on a free walking tour, first of,the,Jewish district and then of the old town. Great deal. Our guide worked for tips,which we gave him. he was funny and well informed and we also met a sweet 23 year old guy from Chile who reminded me a bit of my son and of my much younger self. He was traveling on a budget of 15 euro a day (about $20), hitch hiking and sleeping at hostels or couch surfing (something they did not have in my carefree youth.) It was fun to meet people from so many places on our English speaking tour – Ireland, Mexico, Portugal, Kurdistan, Idaho, Pennsylvania. We had drinks with an Indian guy from Stockholm. And now we are on the overnight train to Prague which is all good except that our sleeping cabin is next to a loud American woman whom is having an argument with her grown son who apparently doesn’t appreciate the trip she is funding. My ear plugs are not up to the challenge. I may have to resort to my iPod which Dirck, on the upper bunk, has already employed. I am definitely glad that we booked these tickets well In advance because the sleeping cabins appear to be full. photos below of area outside train station in Prague and aboard krakow-Prague train. – No need to join a tour group to visit. It’s not hard to visit on your own. – We.took a bus from Krakow’s main bus station north of Old Town directly to the site, now a museum. The Train doesn’t leave as frequently and doesn’t go directly to the museum but instead to the town of Oswiecim, the town where Auschwitz is located. – The bus comes about twice an hour from what we could tell. The return bus was particularly packed with hot, tired, sometimes cranky travelers. – The place was swamped with visitors but mainly well organized after some initial chaos. 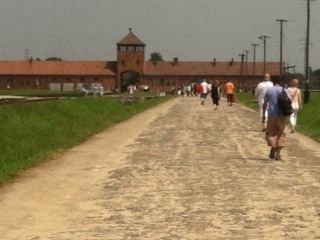 People are divided into large groups, by language, and led through both camps with a guide. We also received headsets so we could hear the guide better. Our guide was informative, as expected, and more caustic than expected, clearly repulsed by what he was showing us but convinced of the need to show us. Hard, strange job to have. – Our English speaking group had only a few Americans. most people were from other European countries. There was also a family from Israel with three elementary school age children. I was surprised by how many children were there. Not sure I would bring my kids when they were grade school age. The guide told parents not to bring their kids into certain rooms and the parents complied. – There were many very sad and disturbing things on display…piles of abandoned suitcases, the keys of people who locked the doors to their homes when they were deported (thinking they would return), huge piles of human hair, human ashes, photos of emancipated people and their pitiful daily food ration, the large model of the gas chamber and the chilling detail about its efficient design and operation. What got me most, in a tangible emotional way, was anything to do with children – the discarded baby clothes, the haunting “official” Nazi photos of children, some eyes almost lifeless, some eyes too full of life and clouded with tears. 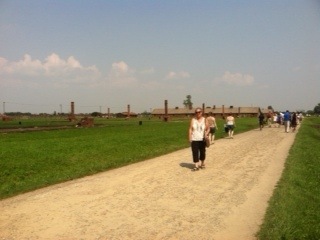 -Do not skip,the Birkenau visit. It is a particularly haunting and moving place that in some ways matched my preconceptions about death/concentration camps even more than Auschwitz, with its vast size (25 times the size of auschwitz); long abandoned railroad track leading from the imposing dark brick building st the gate deep into the camp which has some remaining barracks but also the burnt out shells of many burned out others; the swampy lagoon containing the ashes of so many murdered people; the dark chicken coop like barracks for human beings with rows of worn three level bunks where people were packed like sardines (or chickens) into each level. Hard. Wood. Primitive. Barbaric. Dehumanizing. Unfathomable. Heartbreaking. Evil. – Go even if you don’t really want to and aren’t sure you can bear it. You will be glad in the end that you and some many others bore witness; that it is there for people to see. It has to be seen to be believed, even if its hard to see or believe or understand. Oskar Schindler’s famous factory in an industrial area of the Podgorze neighborhood south of the Wisla River (and south of the Kazimierz district where we are staying) has been turned into a very powerful museum tracing the history of the 5+ years of the Nazi occupation of Krakow and Poland and the devastating effects for Jews and other Poles. Apparently Steven Spielberg helped increase tourism to Podgorez and especially Kazimierz by filming “Schindler’s list” on site. Like the Solidarity Museum in Gdansk, this museum uses artifacts, old photos, old films, survivor interviews and recreated settings to give you a real feel for the time and place. Like the Holocaust Memorial in Berlin, I found that I got choked up at first but then quickly sobered and pushed through the museum. 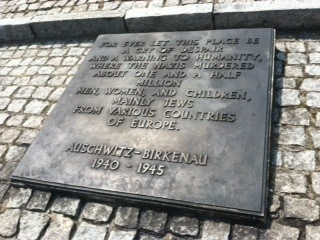 We will see it this works with Auschwitz, which I am trying to steel myself for a visit tomorrow. Podgorze was the Jewish ghetto where Jews in the Kazimierz neighborhood and elsewhere in Krakow were forced to relocate by the Nazis before they were moved to concentration camps. Today, there are plaques all over the area explaining what various buildings and sites became during the Nazi era, including most powerfully a central square where Jews were deported, beaten, executed, separated from their families et al. 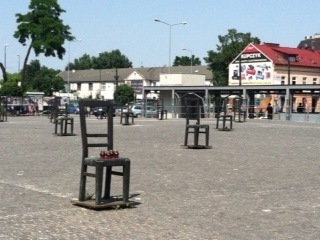 Today it is an expanse of asphalt with a sculptural tribute – 70 large metal and achingly empty chairs and is called Ghetto Heroes Square (Plac Bohaterow Getta). Holocaust tourism, for lack of a better phrase, is a strange thing,because you cannot help,but feel uncomfortable about it,,guilty even. We also visited some far more cheerful places in the area including MOCAK, a contemporary art museum in a striking modern building next to Schindler’s factory and BAL, a hipster cafe/restaurant with artsy people hidden in a still industrial area behind MOCAK (and tricky to find). 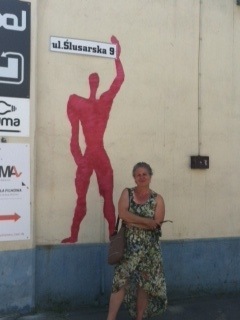 It is on Slusarska Street, an evocative name for us since it is very close to the last name of good friends of ours back in Iowa. Tonight we went to Klezmer Haus, an old restaurant serving Jewish,food and klezmer music. Nice to see some jewish traditions still alive….excellent “Jewish caviar” aka chopped liver although different then my grandma’s, not creamy but instead dry chopped liver with shredded egg on top. Still I was a little worried that we should have stayed in the picture postcard perfect Old Town, about 20 minutes walk north of Kazimierz…until we got here (our train arrived right on time by the way, despite the dire predictions of our Polish friends). Old Town is spectacular, with the largest Medieval square in Europe, full of imposing churches and other historic buildings. (Our terrific guide “In your Pocket” described the buildings as looking like they were sculpted out of marzipan.) But there are tons of tourists and the place looks almost too perfect. We like the rough around the edges Bohemian Lower East Side (another NYC comparison, cant help myself) feel of Kazimierz which has a more grubby and much smaller but somehow endearing square Pl. 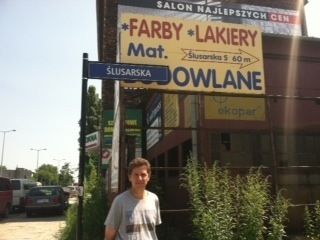 Nowy, with a flea market and a strange round building selling a popular street food that’s basically a pizza bread. We also like our sweet old 11-room Hotel Karmel, on Kupa street, right in the middle of the district. It is an old fashioned place, with a light wood central (no elevator) leading two flights up to our narrow room with light yellow walls and drapery and an old wooden armoire. 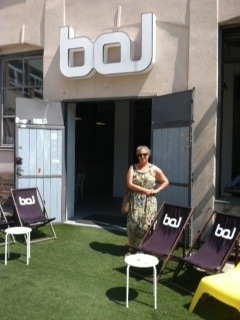 I am also intrigued by all the Jewish buildings and the hopping cafes, boUtiques with handmade dolls, and beer gardens. Its an interesting mix of Old World and edgy. For dinner we went to Szara, one of the restaurants lining u. Szeroka, many of them Jewish, serving Jewish food and klezmer music. Pork chop and grilled salmon and potatoes and oneof the better mixed green salads we have had during the trip. 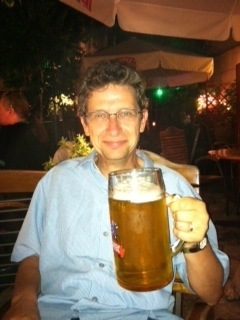 Also went to a beer garden down the street from our hotel where Dirck mistakenly ordered a liter of beer (enormous…see foto below). Also had Krakow’s famous apple pie, Szarlotka, and coffee at the old cafe, Noworolski in Old Town in the Cloth Hall where comrade Lenin hung out, and after that, alas, lots of Nazis. – There sure are a lot of stunning Polish women. – The names of Polish towns remind me of the lines you are asked to read on an eye chart at the optician’s. ex: TCZEW ( one town we passed on the train ride here). Imagine trying to pronounce that. – We haven’t seen (or heard) many U.S. tourists. More of the English speakers appear to be Brits. – the best thing at our hotel breakfast this morning was the sour dill kosher pickles, akin to my favorites at home but I found it hard to eat them first thing in the morning with a cup of coffee. 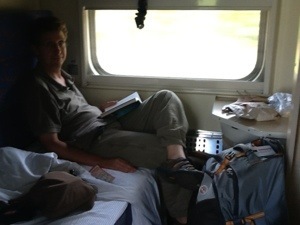 We wanted adventure, we got adventure, here in a sleeping car with a bunk bed en route from Gdansk to Krakow. Our Polish friends all came to see us off at the station near midnight – Adam and his mother, Michel and his girlfriend Anna ( who came with a parting gift – bottle of Goldwasser, the Gdansk liquor that includes visible flakes of Gold. 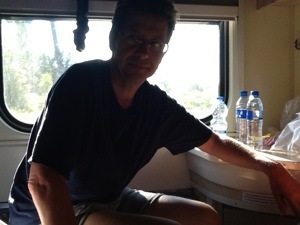 (See foto below) Our luggage is pretty boozy…D already has a bottle of Ukrainian vodka he got for a gift. Our Polish friends took care of us well throughout our three day trip, eager to show us around and very generous, which was very sweet and gave us some insights into real life in Gdansk and Poland that we would not have gotten otherwise. yesterday, Adam and his mother ( in another foto below) picked us up and whisked us off to the Bishops cathedral, home and park landscaped with lovely flower beds. There was a Saturday morning organ concert in the cathedral and my eyes were not deceiving me: the gold trumpets of the angel statues embedded in the ornate organ really did move around when the music played. They also drove us past Lech walecsa ‘s house nearby. Then Michal picked us up and drove us about an hour away to Malbork Castle, an enormous 13th century castle housing Teutonic Knights from Germany who were also, oddly, monks as well as hired guns for Poland to fight Russia who later ended up fighting and defeating Poland. At night, we went to The modern high rise apartment outside the old town where Adam and his mother live for a huge meal of cold cuts, various salads and cheeses and meat spreads and chunks of white cream with a layer of red jello with strawberries. Next stop, the Baltic Sea pier in Gdansk where there was a lively disco and some restaurants and some people swimming in the dark cold water. From there we went to the high tech domed observatory of adam’s former school where he showed us Saturn and various stars through a telescope. We didn’t get back to the hotel until about 12:30 pm. This morning, Adam picked us up and we went to the very interesting Roads to Freedom exhibit documenting the Solidarity Movement, complete with replicated shops showing the scarcity during communist times and lots of test old photos and footage of the struggle during the 1970s and 1980s. A new larger museum is in the making but I really liked the simplicity of this one. Adam handed us off to Michal and Anna who drove us to the nearby resort seaside town of Sopot which was packed with vacationers on a spectacular summer day. 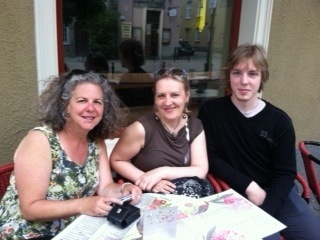 We met up with Michal’s mother and had very good pasta and risotto at one of the many busy restaurants surrounding a wide plaza that leads to a long wide pier jutting out into the Baltic, and a little marina with very large pleasure boats. you had to pay to walk the pier, which was a bit surprising. we were joined by some very well healed pele, including some stunning, presumably Polish young women. Michel and Anna patiently joined us as we shopped for some amber gifts back in Gdansk on Mariacka Street, then Adam and his mom returned and took us back to their house for dinner, shopping at. Huge tesco for train provisions and a visit at sunset to the Dramatic 1950s era monument across the river from old town marking the start of World War Two. What a visit. We loved seeing our friends (Michael, Adam, Anna who we last saw in Des Moines in 2009) and their lovely mothers and city. Here’s hoping we meet again.